Diamond Bank Kenya which is associated with His Highness the Aga Khan, is in the spotlight over claims of money laundering only a few months after it was fined Sh162 million by the Central Bank of Kenya for being used as a conduit by suspects in the multibillion shillings National Youth Service fraud. Weekly Citizen has information the Bank CEO, Naseen Devji, was arrested and grilled by Anti-Terrorism Police Unit. However, the question that is being asked is as to why she has not been arraigned in court. In fact, investigations reveal that the CEO was aware that one of the terrorists, Hassan Nur, made 13 withdrawals of Sh400,000 each on January 4 2019 and another Sh100, 000. However, the CEO’s presumed prosecution has been shelved after what insiders at the bank claim was due to a phone call from His Highness the Aga Khan, the leader of Ismailiah sect made to Uhuru Kenyatta. It is imperative to note, the current house which Uhuru owns located next to State House was donated by Aga Khan to the late first president of the nation Jomo Kenyatta who is Uhuru’s father. In a paidup advertisement in one of the dailies, the bank’s company secretary Stephen Kodumbe said: “DTB has taken note of the charges preferred on February 20 2019 against Sophia Njoki Mbogo, the branch manager at our Eastleigh branch. We continue to cooperate with the law enforcement and stand with our fellow Kenyans during this challenging time of seeking answers”. Weekly Citizen has information that Naseen Devji ordered the Eastleigh branch manager, Sophia Mbogo, to allow the withdrawals. Mbogo was charged in court for authoring the withdrawals of Sh34.7 million believed to have aided in the Dusit terrorist attack in Riverside on January 14, this year. 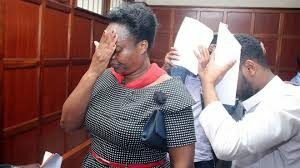 Njoki was charged and pleaded not guilty to three counts; failure to report suspicious proceeds of crime, aiding and abetting terrorism and failure to report money laundering. She denied the charges before Milimani Law Court chief magistrate Francis Andayi and was released on bail. However, there are claims senior officials at the bank are involved in money laundering where they connive with some crooked government officials. Njoki’s arraignment in court came shortly after the bank was sued by a client who lost Sh150 million mysteriously from her fixed deposit accounts at one of the bank’s branches in Nairobi. The case exposed the underhand deals at the bank. Sun Pil Lim, a South Korean investor and chairperson of Daehan Pharmaceutical Limited, took DTB to court after her attempts to get an explanation from the bank regarding the state of her accounts fell in deaf ears. She filed two lawsuits at the Commercial and Admiralty Division of the High Court in efforts to recover her money. According to the court documents, Lim and three directors of Daehan Pharmaceutical Limited identified as Jolly Jeminah Lanji Ouko, Lee Jong and Jang Jongmin opened a fixed deposit account at DTB, Thika Road Mall branch, on May 19 2015. Daehan Pharmaceutical deposited Sh100 million in the fixed account on October 24 2015. Two of the company’s directors were appointed signatory to the account. Lim, who is wife of Safari Park Hotel president Young Roh opened another fixed account in her name and deposited Sh50 million in the account. DTB issued certificates of deposits on October 28 2015, and November 5 2015. Trouble started when Daehan Pharmaceutical Limited board in December 2017 sought to know the state of the fixed deposit accounts. Lim alleged the company failed to get information they were looking for from the DTB and that the branch manager became evasive. The investor then moved to court to force the bank to furnish her with information regarding her accounts and the order was granted. DTB finally provided Lim with the documents and it was at that point she discovered money had been withdrawn from the accounts without her approval as one of the signatories. The money, according to documents, was withdrawn between March 10 2016 and December 4 2017 using 157 cheques in what took a total of 146 transactions to clear the entire Sh100 million. She claims one of the directors, Lee, forged her signature and conspired with the bank manager to liquidate the account and share the money. “Mr Lee informed us that he shared the money with the said manager in order to be allowed to liquidate the deposit and withdraw the money,” reads the plaint. To facilitate the liquidation and withdrawal, Sun claims the bank relied on an undated letter on July 12 2016, which led to the premature liquidation of Sh30 million, where her signature too was forged. Similar letters were presented to the bank on July 12 and October 26 2016 and were also used to liquidate the remaining Sh70 million. The same scheme was used to empty Sun’s personal fixed deposit account, which is the subject of the second civil suit, case number EO 68 of 2018. She says that although in the account where she had put Sh50 million she was the sole signatory, Lee forged her signature, wrote a letter requesting the liquidation of the deposit, which was then transferred to a different account. She wants the court to order DTB to pay her a total of Sh169,944,520, as well as the interest this money has earned from October 24 2016, costs of the two suits and any other relief the court may find fit. The bank has not yet filed its response to the two suits. There were other reports, intense lobbying by the bank directors was the reason the Anti-Terrorism Police Unit failed to charge the bank’s chief executive who had earlier been arrested, with aiding terrorism by failing to report suspicious transactions. This came as her juniors cooled their heels in various police cells but pressure from the directors hampered everything. The Anti-Terrorism Police Unit had prepared to charge the CEO. ATPU within the National Police Service is mandated to mitigate terrorism-related cases in the country. They had arrested the CEO, and detained her for a few hours before pressure from top government officials forced them to release her. Six months ago, a senior bank employee, Sungu Nyakomitta of the Kisii branch was accused of siphoning millions of shillings from customers’ accounts. Reports shared by the Directorate of Criminal Investigations revealed Nyakomitta of Diamond Trust Bank stole Sh25 million from a customer’s fixed account numbers. “Peter Sungu Nyakomitta, a Branch Manager with Diamond Trust Bank (DTB) in Kisii was arrested and arraigned in Milimani Law Courts for stealing Sh25million from customer’s fixed account numbers. The theft was discovered after an internal reconciliation process was done,” the DCI tweeted. Last year, the Central Bank of Kenya slapped hefty fines on five top banks alleged to have been involved in the transactions of the second phase of the National Youth Service scandal. The five banks, which were fined a total of Sh394 million include among others, Kenya Commercial Bank, Equity Bank, Standard Chartered Bank, and Diamond Trust Bank. Diamond Trust Bank was fined Sh56 million. A statement issued by the Central Bank indicated over Sh3.6 billion was wired through the five banks with the largest flow of Sh1.6 billion having been channeled through Standard Chartered Bank. Diamond Trust Bank facilitated Sh162 million from the NYS loot. The Diamond Bank board includes Abdul Samji, chairman. Samji became the chairman of the DTB Group in May 2010 after having been appointed to the board in 1997. 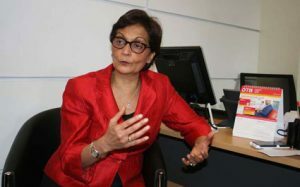 Nasim Devji, group chief executive officer and managing director joined the DTB Group in 1996 following which she was appointed Group chief executive officer of Diamond Trust Banks in East Africa in 2001. Irfan Keshavjee and Ismail Mawji are on the bank board of directors together with Jamaludin Shamji.